Well, well. 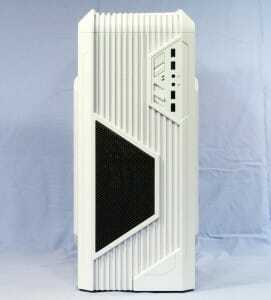 A new case from Enermax. The iVektor comes in three colors: Black (naturally), White, and a bright Red! And they are advertised as having a “special rubber skin” that supports the blinding white and red colors, and gives these cases a “soft touch.” I’ll be reviewing a white specimen of the iVektor. As advertised, the front and top of the case feature a rubberized coating that really does give a classy soft touch. It just feels cool. And the ribs make the case look compact. These are pretty cases. But pretty is as pretty does. 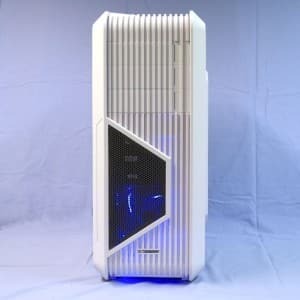 How do these cases do? Read on. 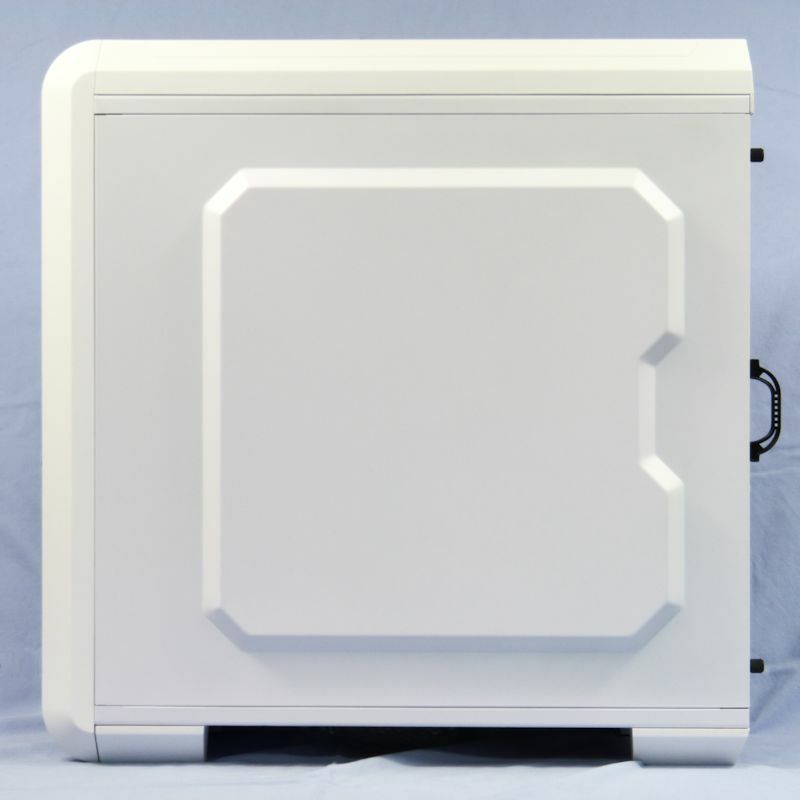 In English units, the case is 19.5 inches deep, 9.2 inches wide and 20 inches tall – close to a square. Note that Enermax is advertising 179 mm of heatsink clearance and 30 mm (a generous space) behind the motherboard. That kind of information helps you decide whether a case is right for you. 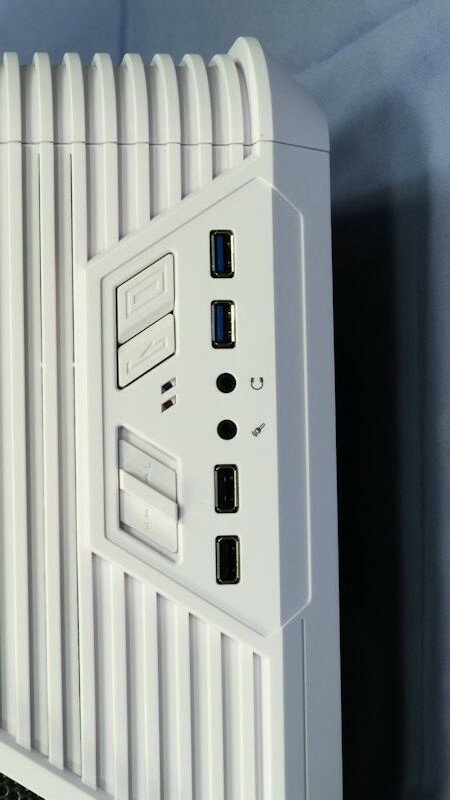 Finally, they note that they provide two USB2 ports and two USB3 ports. 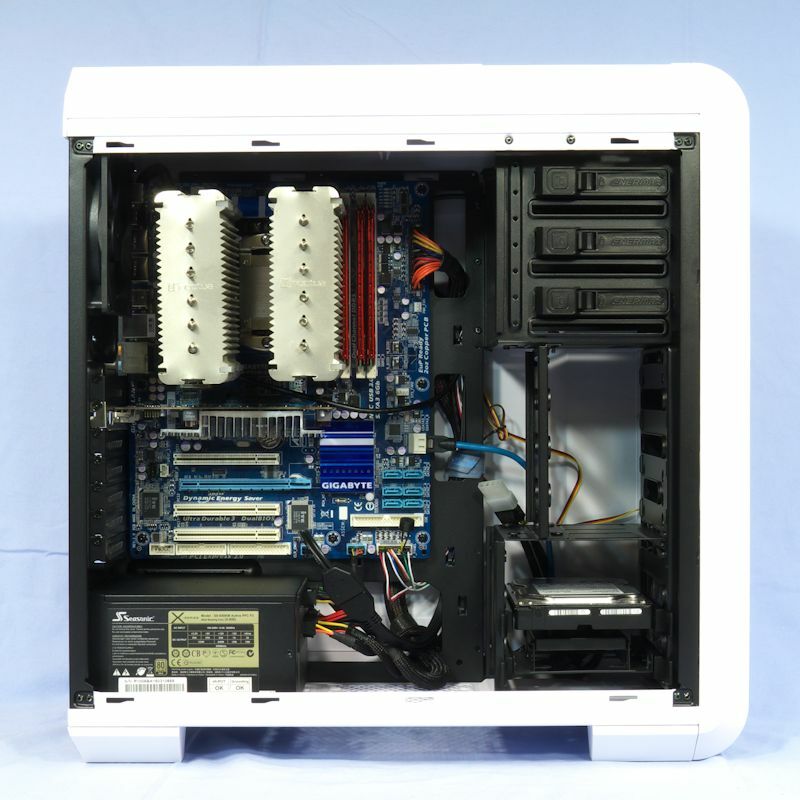 Most modern motherboards support at least that many USB2 and USB3 ports. So, having these allow you to plug in wireless nubs for your mouse and keyboard while leaving you two fast USB3 ports available for your USB3 flash drives. 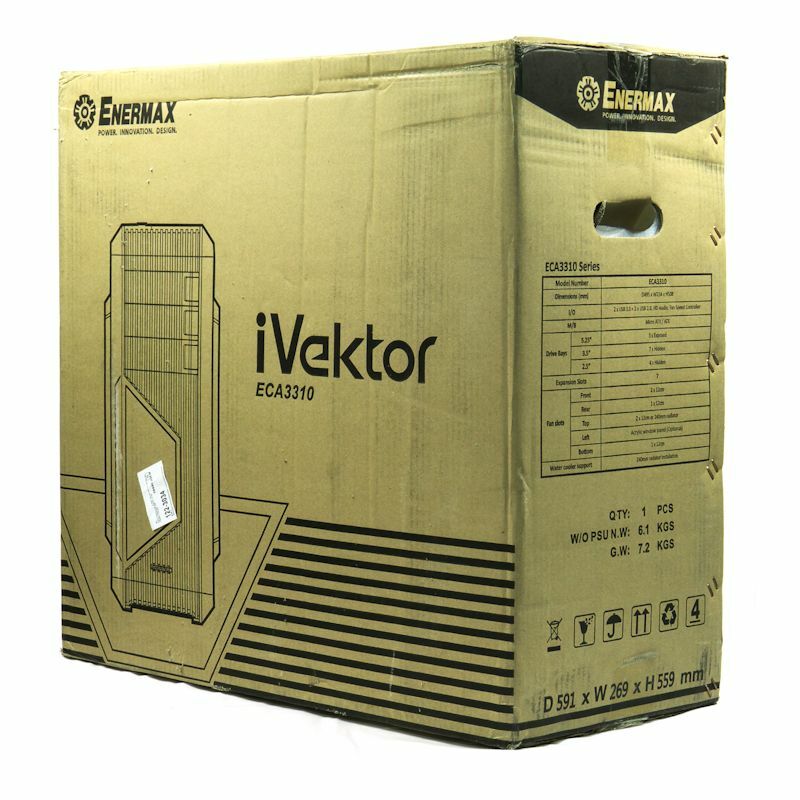 The Enermax iVektor comes in a cardboard carton that has its specs on one end. Inside, we see the typical Styrofoam caps and plastic bag. 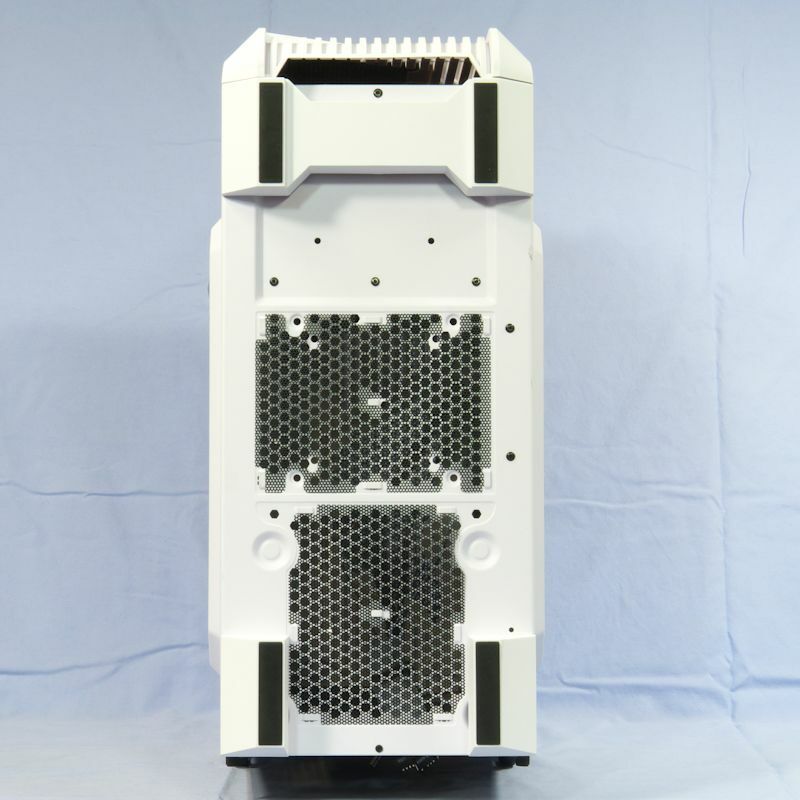 A head-on view of the Enermax iVektor lets us admire the pristine white rubber with its ribs. Although this is a wide angle shot, you get a hint of the expanded sides. A front oblique angle gives a better appreciation of the case’s proportions. The plastic sheet that protects the window is matched by another sheet that protects the inside of the window. 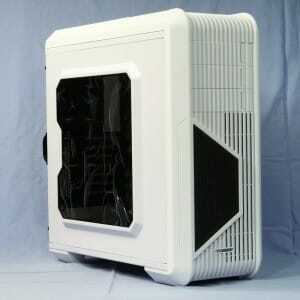 The rear handle should remind you of the Enermax Coenus. One thing you notice immediately about this case is how light it is. 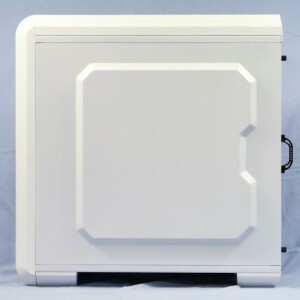 Most cases have some heft added when you put plastic tops and fronts on them. This rubber seems to weigh very little. 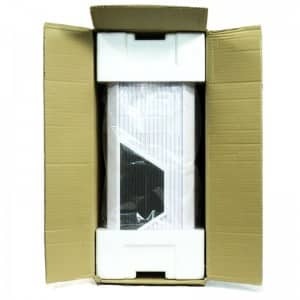 The left side of the case shows both outer and inner layers of the protective plastic, if you look for them. The rubber front and top do a good job of matching the painted side panel. You should not consider this as a given: rubber is rubber, paint is paint and steel is steel. The thumbscrews have plastic shanks, rather than being made of one-piece metal. They are easier to work with than all-steel or all-aluminum screws. 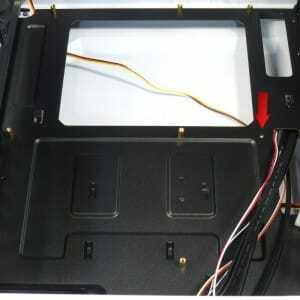 The right side shows the color match again, and here you get a clear picture of the expanded area of the panel. The tall feet give plenty of clearance under the case for drawing in air. A top view lets us see that the theme of ribs and angles is carried back along the top. Behind the IO cluster is a filtered fan window. It can be used as intake (it has a foam filter) or exhaust (remove the filter). My only complaints are that the grill is moderately restrictive and the window is on the small side. But it is stylish. Here we get a closeup of the IO cluster. 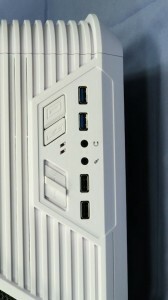 In front are the two USB3 ports with the two USB2 ports further back. The microphone and headphone jacks are between them, all in a neat line. 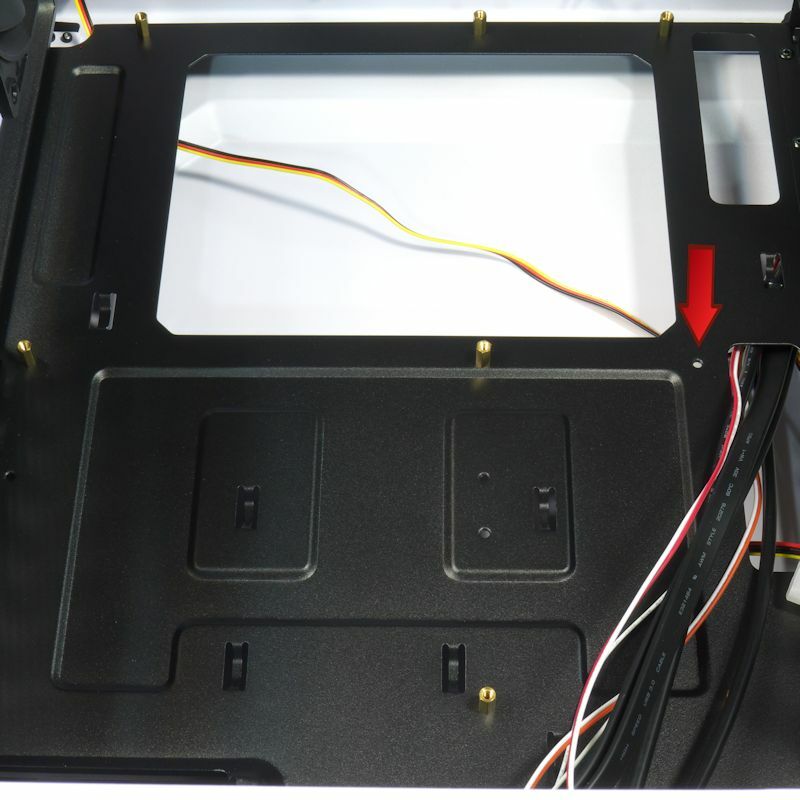 To the right you can see the on-off and reset buttons, along with your standard case LEDs. At the back of the IO cluster you have a sliding switch that controls the fan speeds – high on one side, low on the other, and off in the middle. 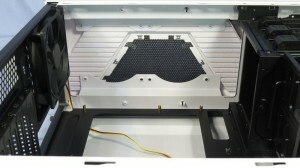 The bottom view of the Enermax iVektor shows “Removable dust filters at bottom for easy cleaning.” First of all, those black things are not filters – they are simply restrictive grills. Second, they are not that easy to remove. So, do it when you have access to the bottom of the case before you have put anything in it. That said, the grills cut into the case itself aren’t bad. When you remove the left panel you get a black inner space. It matches the back panel, so it is not a terrible surprise. 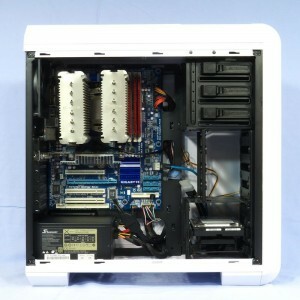 The most prominent aspect of this space is the CPU window in the motherboard tray. It is very large; about as large as such things get. Going clockwise from there, we see three tool-free latches for 5.25” devices. Below that, in the four-position 2.5” HD bay is the box of accessories. 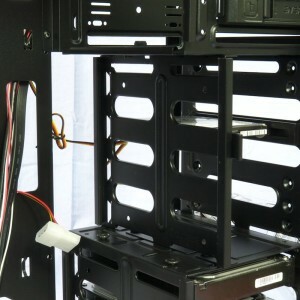 At bottom is the three-slot 3.5” HD bay. The right panel is still attached in this picture, so you can see where it is expanded. Looking under the top deck, you can see there is space for two 140 mm fans. The potential fan area is much larger than the filtered window on the top panel. That stuff in the interstices of the grill is foam. That’s not bad filter material, but the combination of grill, foam and small window suggests that fans here will struggle a bit. 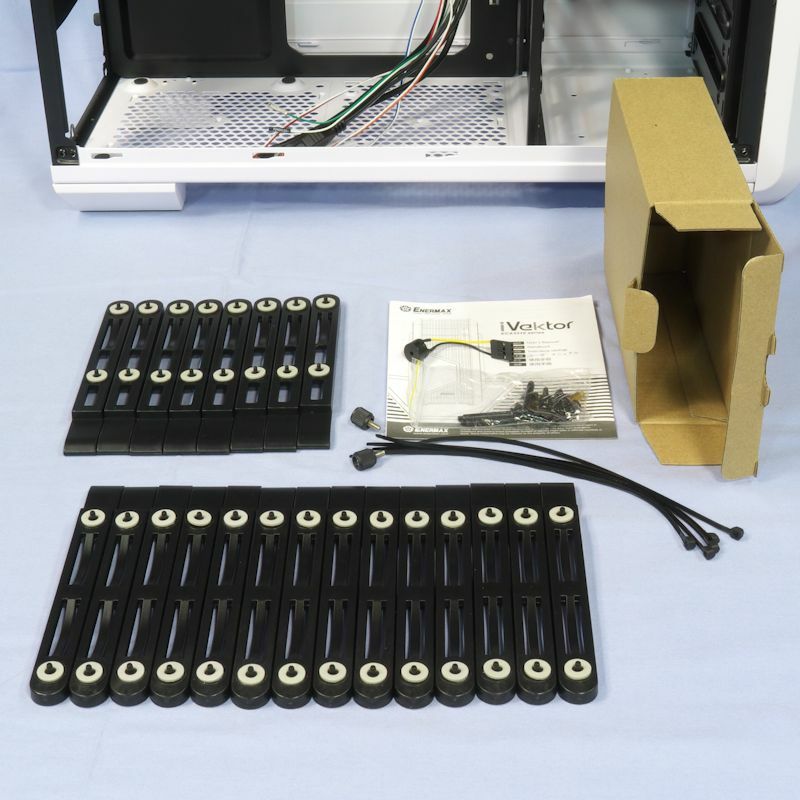 The accessories include rails for four 2.5” drives and seven 3.5” drives. These are just like the rails from the Enermax Coenus. I like them because they leave the entire top and bottom of drives bare to airflow for better cooling. 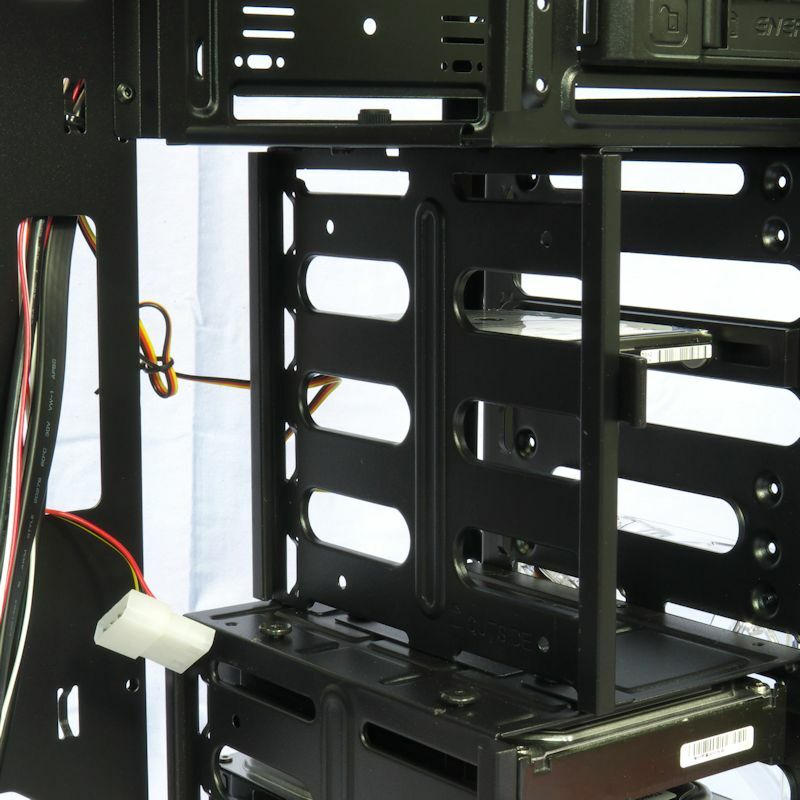 There are seven pairs of 3.5” rails because you can reset the 2.5” HD cage to 3.5”, and Enermax gives you enough rails to populate all seven slots with hard drives. You can just make out the ninth standoff in the accessory bag – it is the brass-colored piece. Toward the back of the picture you can see the rubber pads a PSU will sit upon. 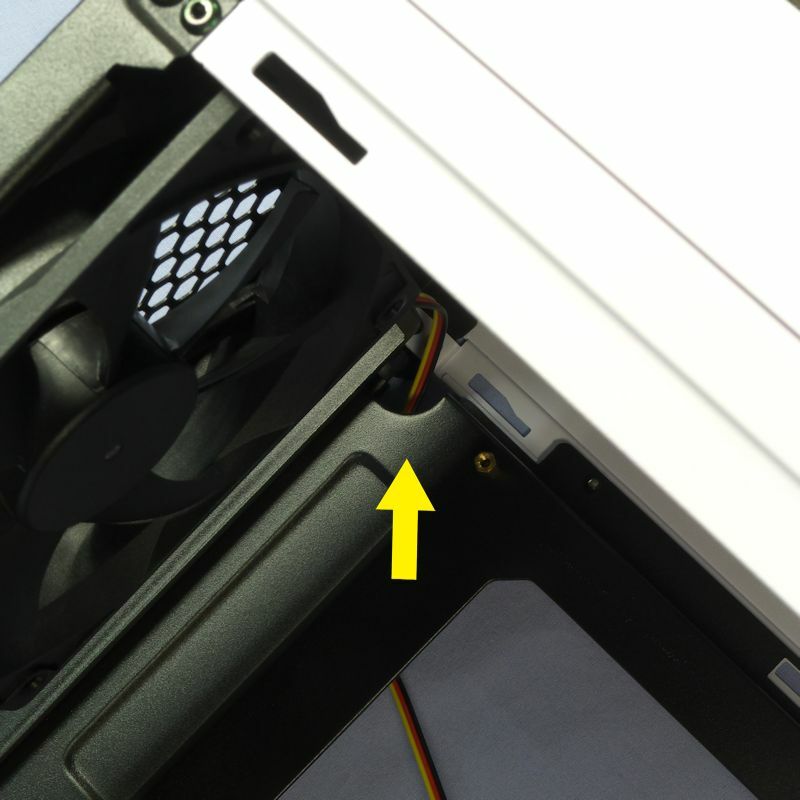 Also, note the grills that let your PSU breathe freely and allow for a bottom intake fan. A closeup of the case wiring shows the usual suspects, but let us applaud Enermax’s choice in not burdening us with an AC ’97 audio plug. Opening up the faceplate gives us a look at the front fan. On the faceplate itself you can see the foam in the grill. Again, this should be an adequate, if restricted air intake. 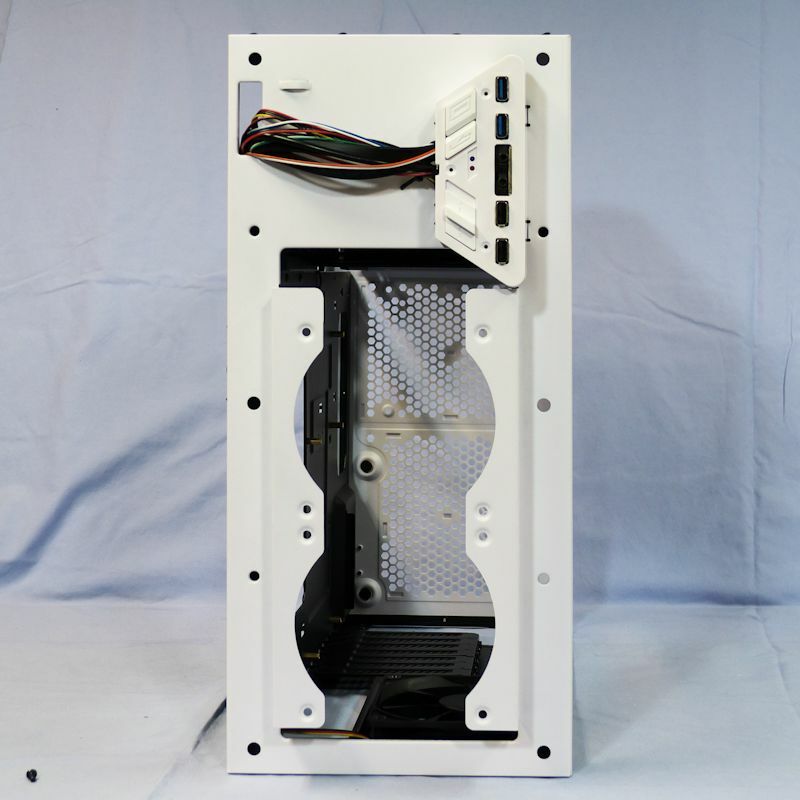 While there is room for a 140 mm fan in front, there are screw positions only for 120 mm fans. Here we see the case with two 120 mm fans. And I put a 140 mm fan in the upper bay just because I could. With the solid slot covers there is no purpose to a 5.25” bay fan. Well, with the faceplate off we can look at those hard drive cages. The solid parts of the metal sidewalls are about as narrow as you get. 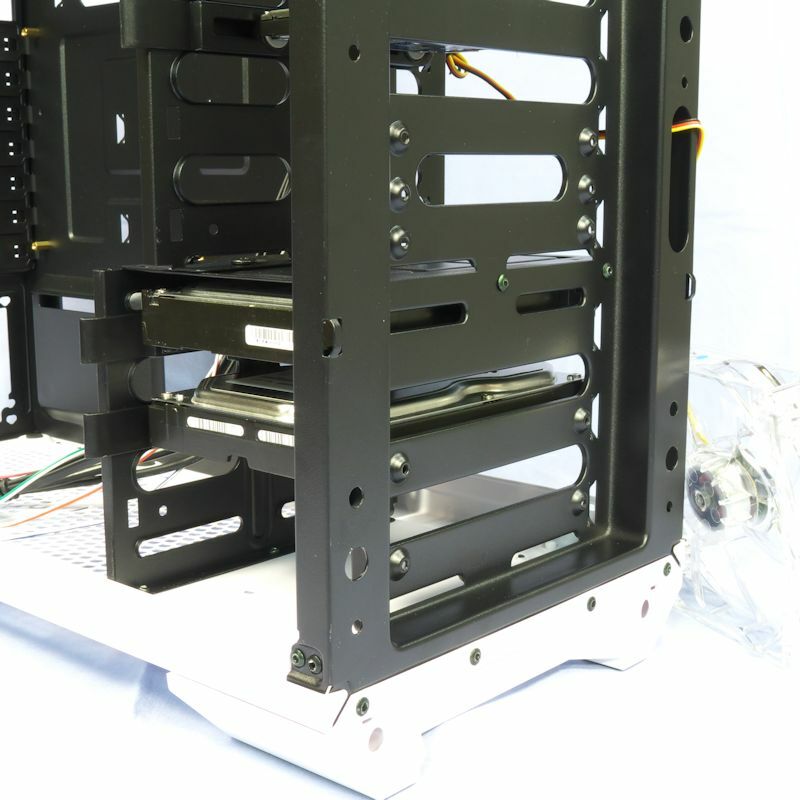 So, air can get by and cool your drives, except for the top of the 3-slot 3.5” HD cage. As you can see from the picture, the combination of the cage’s own sidewall and the hard drive’s sidewall effectively blocks airflow here. About the only drive I would recommend here is an SSD on a 3.5” sled. The upper HD cage has a movable sidewall exactly like the one in the Enermax Coenus (reviewed here). You can see the thumbscrews holding the partition at the top and the T-bolts ready for the slots in the bottom of the partition. There is plenty of space for cooling a 3.5” hard drive, and more than enough for the 2.5” drive pictured. The back side of the motherboard tray looks a bit sparse, but there are details to note. The seven HD positions are clearly seen here. Above that is the 5.25” bay – with no additional hardware (interestingly, you won’t miss that). The CPU window looks huge here. 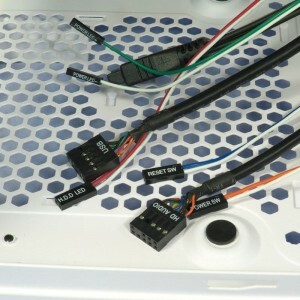 Note the yellow-accented wires that plug into the black wires. Those come from the front and back fans, and that is where they connect to the fan speed controller switch. But, there are only the two connectors. If you want to control the speeds of more fans you will need to use Y-cables. Don’t worry about the lack of grommets. The steel has been rolled at the margins of all the pass-throughs and the CPU window. The edges have been smoothed, so no cut cables or sliced fingers. 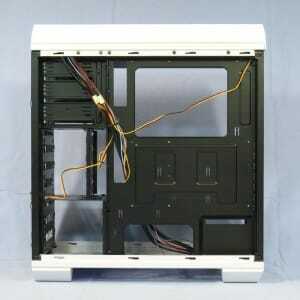 If you want to install top fans, you will need to remove the top cover. You do that by taking off the two screws at the rear of the cover, then popping it off. One of the screws is visible at the lower left of the picture. An iVektor, without its covers, looks as light as it feels. Yet the skeleton is rigid, thanks to quality construction. The side panels of the iVektor are identical to those of the Coenus (except for the paint, of course); open hinges at the front, slender steel dogs at the top and bottom edges. They take a little fiddling to get on, but getting them off is easy with those handles. The clearances of this case are also identical to those of the Coenus. Since I use my testbed setup as my case-testing system, I thought I would leave the CPU cable attached and just feed it through the top left corner of the motherboard tray, swing it around and attach it to the PSU. Imagine my surprise when I could not make that happen. The opening was too small, and it had the case margin behind it (see the yellow arrow below). So I had to detach the EPS12V cable and feed it through from behind. Even that took some pushing. It did not go through easily. Here is the system, installed in the Enermax iVektor. Note the position of the SSD on the 3.5” sled. The 3.5” rails fit nicely on the sled, and allowed it to be put in the lower slot, where the front fan – set in its lowest position – could hit it with air. 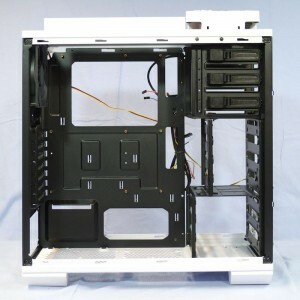 This picture also nicely illustrates how your graphics card will find lots of room. There is no device in the 5.25” slot in this picture, but when I put my DVD player in, it slid in without any resistance until the correct spot. Then there was a solid click, and the tool-free SlideIn ODD holder kept it firmly in place. There was no need for a backside holder, or even a screw. It was that good. The backside view shows that the sheer size of the CPU window leaves lots of clearance around the socket hardware. 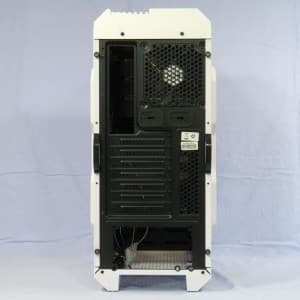 If you want to wait until after your motherboard is in place to install a CPU cooler and backplate, this case will let you do that. 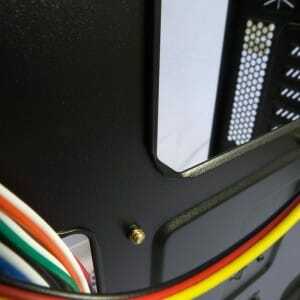 In the lower left center you can see the Molex feed to the fan controller switch. I simply slapped the cables in with a Velcro wrap, not bothering to snug them down to the motherboard tray. The generous clearance of the side panel let me avoid the usual attention to getting the cables to lie close to the tray. As you can see, I did make use of a tie-down point. 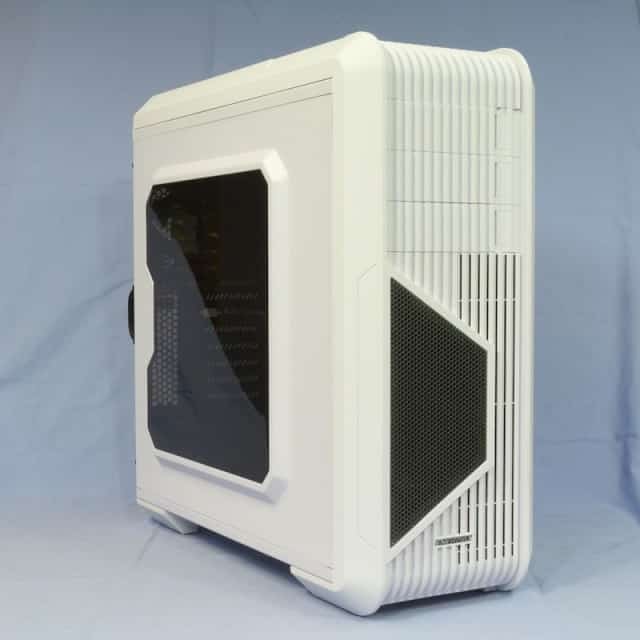 Let us look at this case, built and closed up. 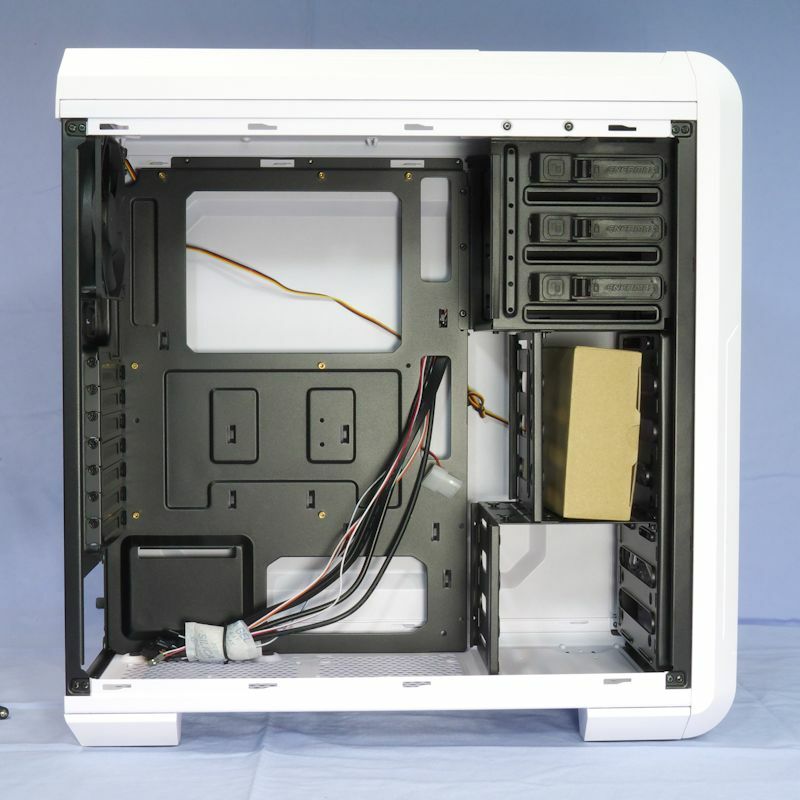 Looking through the window you can see there will be room for a somewhat taller heatsink. 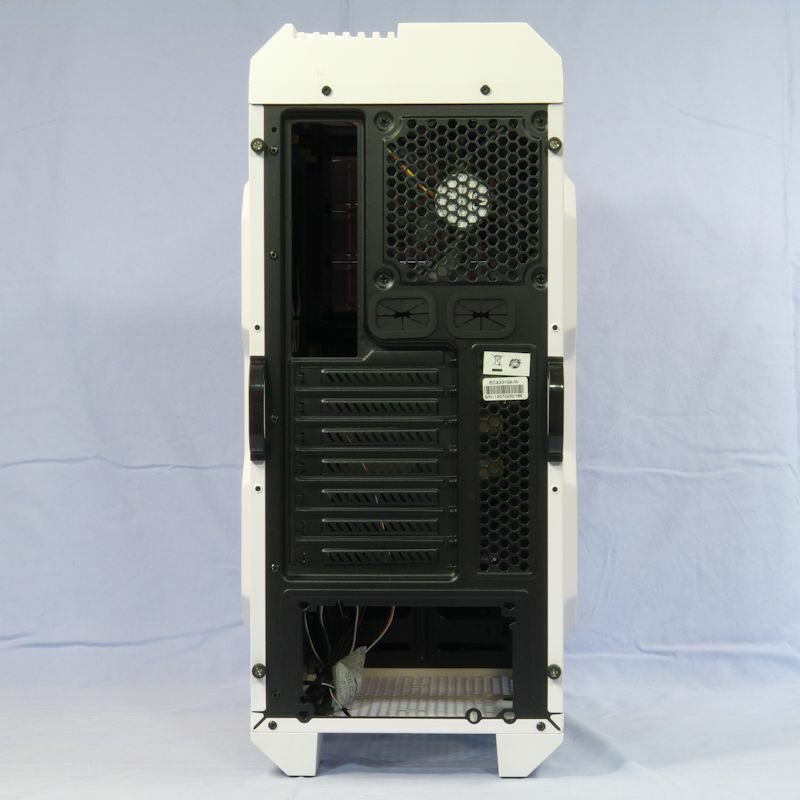 The NH-D14 was installed several cases ago and not moved since then, so the temperatures should be consistent between cases. The iVektor did an average job cooling this passive system, and made an average amount of noise doing so. The results from testing the iVektor are both better than its sibling, the Coenus, and not as good. 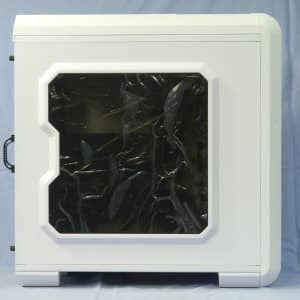 Better because this case produced an airflow that cooled the passive system being tested. But, that was because the Coenus was so open, and the top of this case was not. 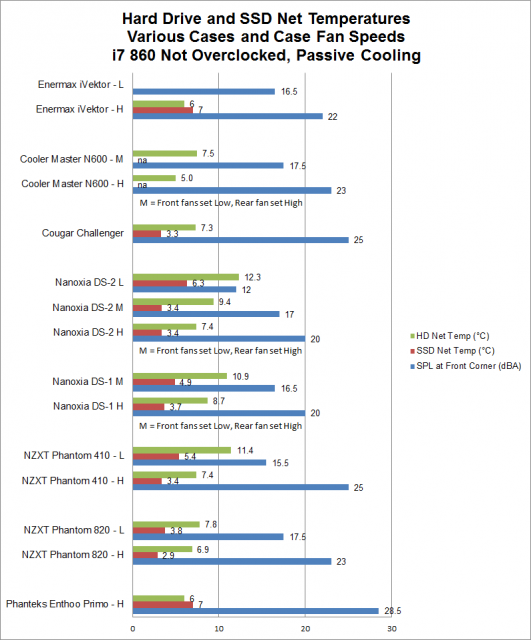 That means the Coenus has the potential to produce much better cooling. On the other hand, if you don’t plan to put in more fans, the iVektor is OK. The walls of the iVektor are thin though, so be sure to put quiet components inside. Building a system in this case ranged from pleasant (the SlideIn ODD holder) to the annoying (this case shares the not-quite-long-enough front screws of the Coenus) to the frustrating (the EPS12V opening). Inside, it is pretty much the same as the Coenus. Outside, it is pretty and has a unique rubber feel. 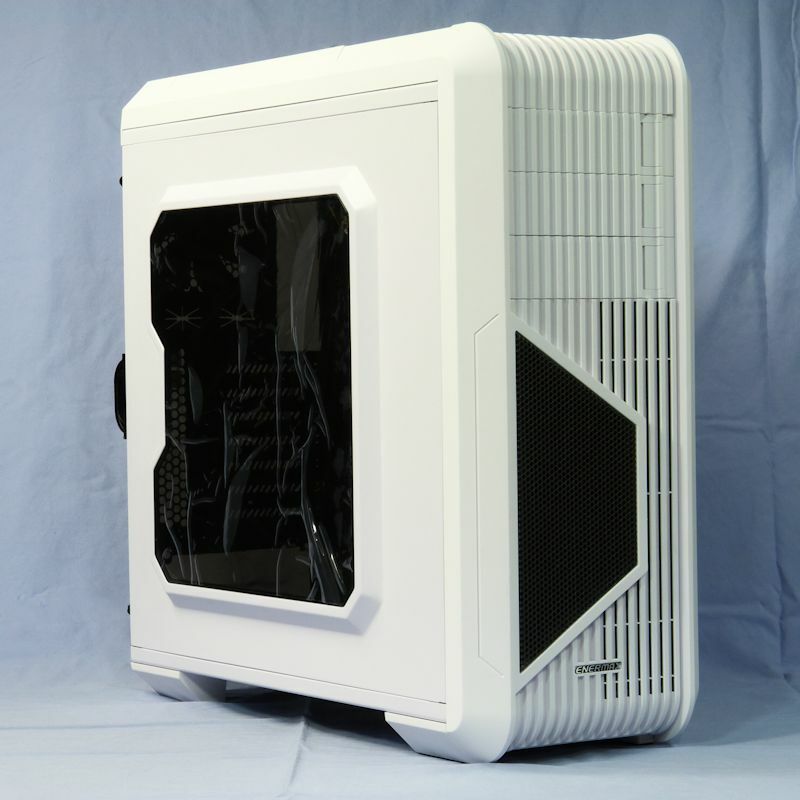 I found the red version going for $75 at Newegg , with the white and black ones for $80, with $10 shipping. At Amazon I found them for $5 less and eligible for free shipping, but out of stock. 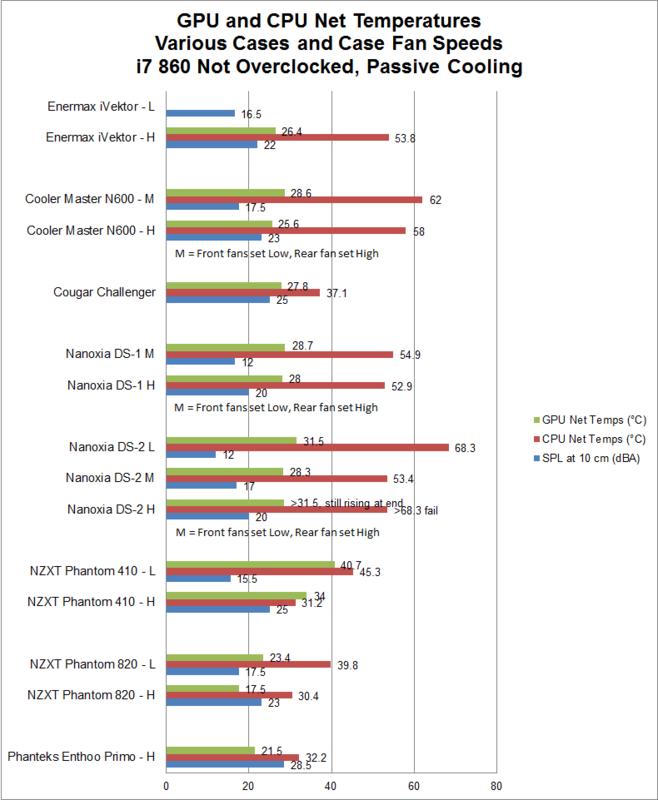 Shopping for comparables at Newegg, I found list prices for the Cooler Master HAF ($70), the Cooler Master N600 ($80), the Gigabyte Luxo M30 ($66), the NZXT Guardian 921 ($70) and the CFI Diablo LT CFI-B1010 ($80). So Enermax has not priced the iVektor out of its league. Attractive, damage-resistant exteriors, with a nice feel. SlideIn ODD holders really work well. Two USB2 ports as well as two USB3. 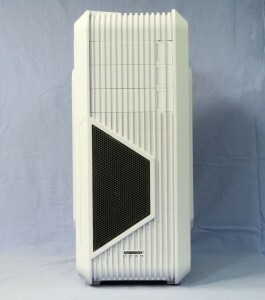 Tall feet allow unrestricted airflow for any bottom-mounted fan you might use. Side window is well protected during shipping. Lots of clearance behind motherboard tray. 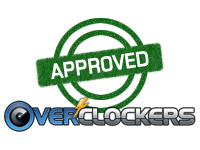 Lots of clearance for large heatsinks and graphics cards. Front screws are a few millimeters too short. The bottom “filters” are just restrictive grills. Not enough room for the EPS12V plug. 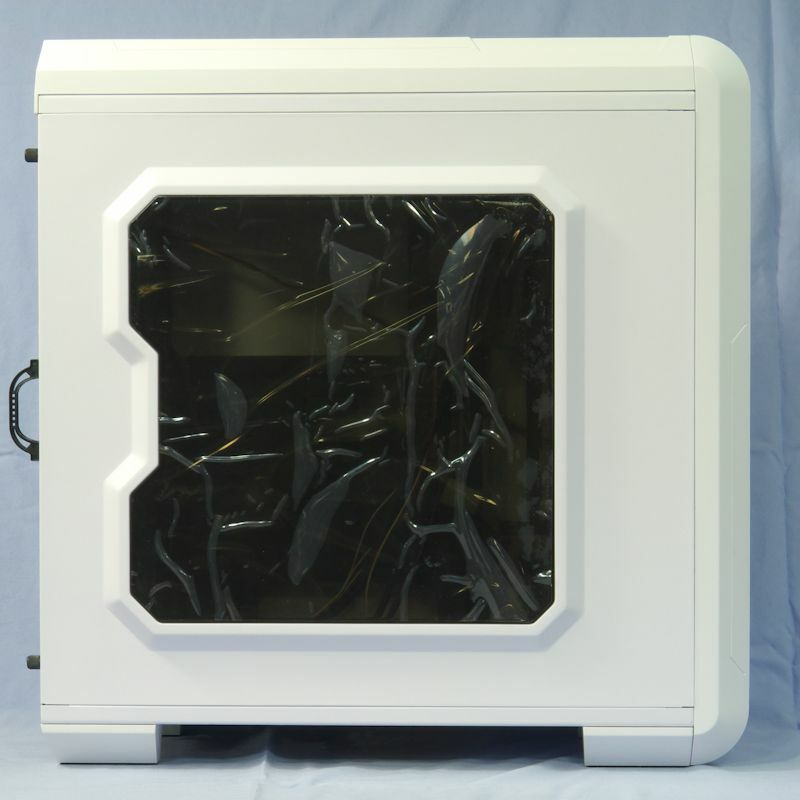 This case pretty much is all about its exterior. It was no fun to work in, but you only do that once unless you are an inveterate tinkerer, and then you will be looking at a very different kind of case. The iVektors are pretty, they have a nice feel and a big window.